The HERO BLOG challenge this week is "holiday tags". I just so happen to be making these as gifts for some friends, so the timing is perfect! See my Flickr photostream for details, or click on the picture itself for a closer look. 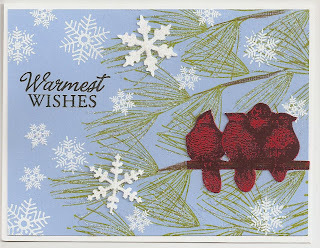 Just a card to wish you all a safe and happy Thanksgiving; hope you all have a wonderful holiday, close to family and friends. The 4 panels were all stamped with the same ink, Brilliance Rocket Red Gold. Held at a certain angle, they all have a lovely golden glimmer to them. 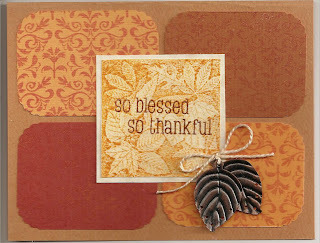 A card made for the Flourishes Timeless Tuesday Challenge (FTTC42), based on their sketch. I tried to use all tone-on-tones as much as possible. The angel's (Denami Design)dress, wings and horn are paper-pieced. She was stamped on a piece of music paper, framed, then layered onto a card stamped in Hero's Antique Flower background, with an embossed (cuttlebug Victoria)strip and a stamped strip (Hero Flourish Pine). The sentiment is from a Hero clear set and the snowflake is an EK Success punch. Working on my Christmas cards - I have to make about 60 or so this year, using a variety of designs, so I try to do something every day. I love a winter's day when it's softly snowing, and the cardinals around our feeder are such a brilliant red. 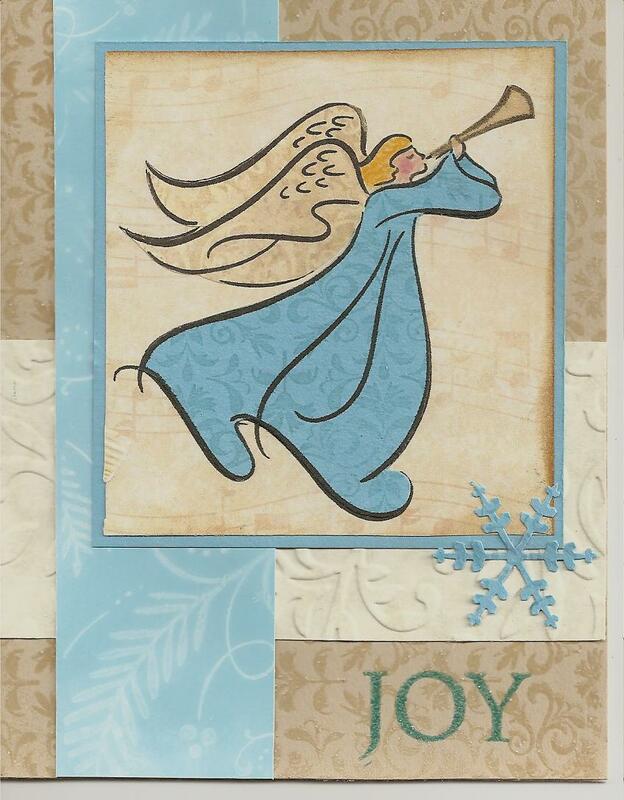 The bird image here is digital - from HERO ARTS SKYLAND BIRDS, which you can find at Two Peas. I enlarged the image, changed the color to all black, and printed it out on red paper, then cut out the birds. The Big Pine Bough, the snowflakes, and the sentiment are all Hero Arts stamps. I punched out 2 snowflakes and glittered them as a final addition. The pine boughs are also glittered. If you click on my card, the glitter shows up better in the closeup. This is almost a total case of JILL'S gorgeous card. What an inspiration! For the trimmings challenge at the HERO ARTS BLOG , I used almost all scraps, except the card itself. For more details see my Flickr post. I'm making a different color version of this on circles for ornaments, and thought I'd make a card using this cute little bear and Lucy's challenge to use pale pink, aqua and kraft. Look what I got from Norway! 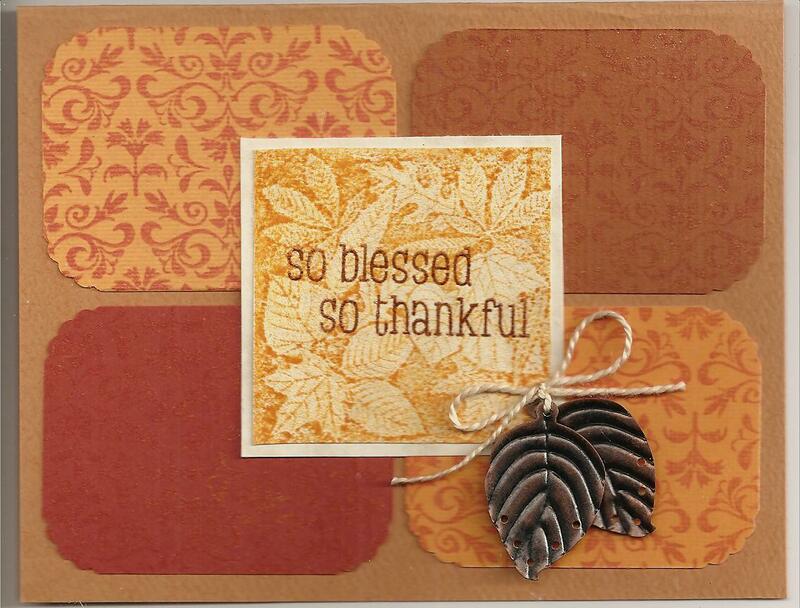 This came from Anette as a result of DEBORAH'S card chain for October. Last month we had 25 participants from all over the world; you might want to watch Deborah's blog on November 24 for signups for the next chain and join in the fun! Isn't Anette's card wonderful? Such a fun thing to find in my mailbox a few weeks ago. If you'd like to see more of Anette's work, see her Flickr stream HERE. Here is my card for LUCY'S first card challenge! 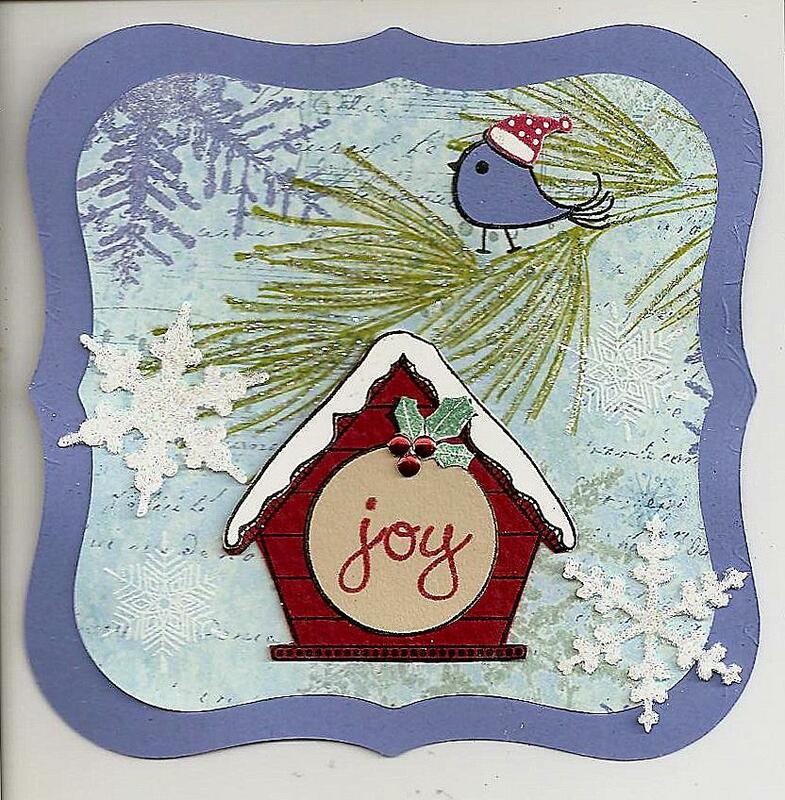 I used an old favorite stamp, the Season's Greeting Collage, backed by a snowflake designblock. This color combination is fun to work with! This is a German word for scissors cutting, the ancient art of cutting paper into decorations. The finished product was then usually put against a darker background, sometimes hand-colored, and then framed. I've seen a few old examples with the paper written on in tiny script, covering most of the design. 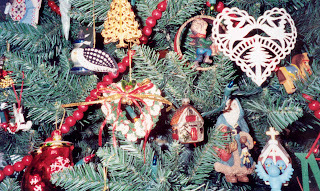 Back in the 1970's or 80's scherenschnitte kits for Christmas ornaments were common, and could be found at craft stores. I even got my special scissors there. But, for whatever reason, it's now really hard to find these patterns anywhere but online. Which is a shame. Other than the initial investment of the scissors, which are 3 1/2" long, parchment paper is easily found, and after a little practice, the patterns are not difficult. Most of the patterns I have are made like the snowflakes we all made in grade school: folding the paper to make the cuts symmetrical. In the case of my patterns, most are simpley folded in half, then you trace the pattern on one side, and keeping the paper folded, cut along the pencil lines, starting from the center, and cutting the overall shape at the very end. Then unfold the paper to reveal the full design. I know, we have lots of ornaments, but I've been collecting for almost 40 years!! 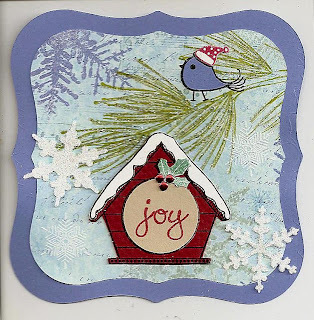 Many thanks to Charlene, from the HeroArts Blog, who pointed me in the direction of the MoxieFab Old Country Christmas challenge - I think this qualifies! Shari Carroll's challenge on the HERO ARTS BLOG this week is "Trimming", using scraps of ribbon, paper, lace, dried or silk flowers and accessories. This is what I had in mind a few days ago, an acetate card with a butterfly glittered from behind and its trail of snowflakes. Once again, there was glitter everywhere, and it REALLY sticks everywhere on the acetate - BUT it comes off nicely with a Swiffer hand duster! If you want to know the steps I took to make it, see my Flickr post here. I had glitter from one end of my desk to the other, but there were bald spots on my butterfly. So this is plan 2. Still a glittered butterfly, but on good old paper, much easier! I also lifted Anette's wonderful idea of making a butterfly trail. She used flowers; these are supposed to be snowflakes (actually iridescent sequins). So just imagine this with an acetate overlay, glittered butterfly and snowflakes on the acetate. Wouldn't that be somethin'? I stamped the main image in a tri-color ink, then colored in most of the flowers with pink, orange, and yellow colored pencils. Then I went over each flower with a fine-point glue pen, dipping the panel into glitter while the glue was still wet. After everything had dried well, I used double-stick tape to go all around the white edges, and then dipped the whole thing again in glitter. Then I just mounted it on an aqua card and added orange gemstones to the centers of the flowers. And here's another card, this time the dark pink glitter is used only as an accent on the butterfly and in the flourish below it. Before I made cards, I was a quilter......I say "was" because, since cardmaking came into my life about 5 years ago, there has been very little quilting around here. (I should really change my Hero/Flickr nickname, but I can't think of anything better.) But I still love the idea of quilting, linking us to past generations, making something that is actually useful, and being able to indulge my love of color. And there is NOTHING better on a cold evening than snuggling up under a cozy quilt with a cup of hot chocolate!! 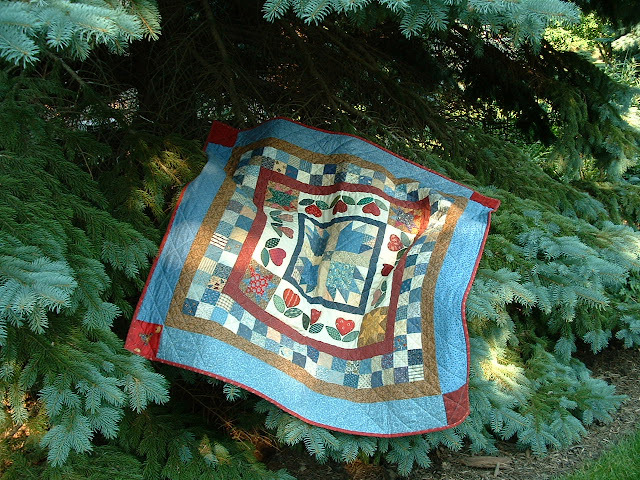 Actually, quilting and card-making are very similar; you start with whole pieces of fabric or paper, cut them into small pieces, and then reassemble them into something more pleasing. I first fell into crafting generally in my senior year of college, when I needed some fluff credits to round out my last semester. I chose an arts and crafts class and made a crewel picture. That was the very first time I was exposed to crafts and since then, I have done counted cross-stitch (until my eyes couldn't take the close work anymore, and the cost of framing become too much), then moved into quilting. There is absolutely no history of quilting in my family, so I took a beginnner's quilting class at my local quilt shop; we made a lap-size quilt from start to finish, all hand done. I have continued that in most of my quilts, only using a sewing machine to sew on the binding. I was so enamored of this art and all the history that goes with it, that I started making doll quilts and selling them through a local shop. Most of them were about 2 feet square, so I could try out different patterns and color combinations with a minimum of time expended. 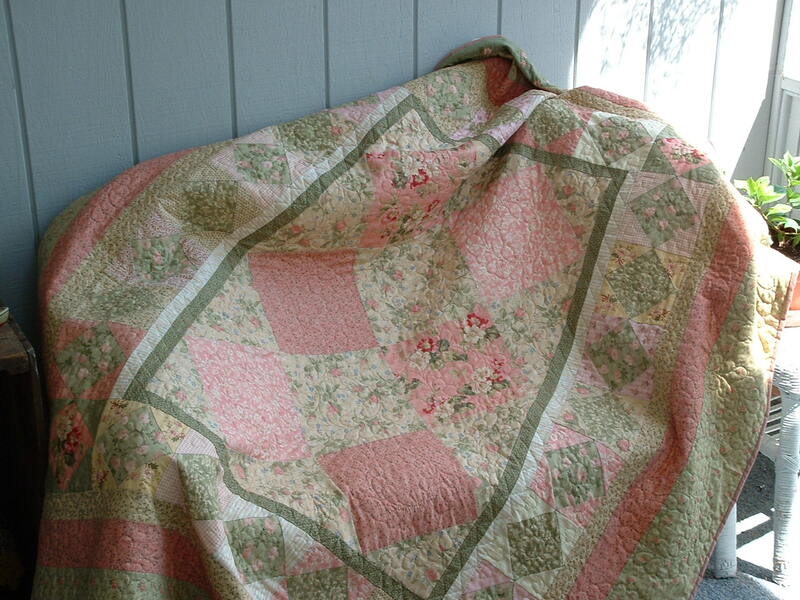 Most of the quilts in my home are these little ones, covering table tops, hanging on walls. It has only been since about 1997 when I started making bigger ones. Most of those are twin-sized.......have yet to make a queen-size for our bed, and now I wonder if I ever will! So, here are 3 of my creations that I am pleased to show you. This first one was a pattern from a miniature quilt magazine that I adapted in my own colors. If you haven't noticed yet, I love blue, so my fabric stash in that color is huge. And I've always liked it paired with yellow. So here is an example of one of my doll quilts. It is about 15 inches square. Click on any of the pictures for a closer look. And here is one of my bigger ones. It was made to match a store-bought quilt which is in a bedroom with 2 twin beds, thus the need for a second one. It uses 2 more of my favorite colors, pink and green. 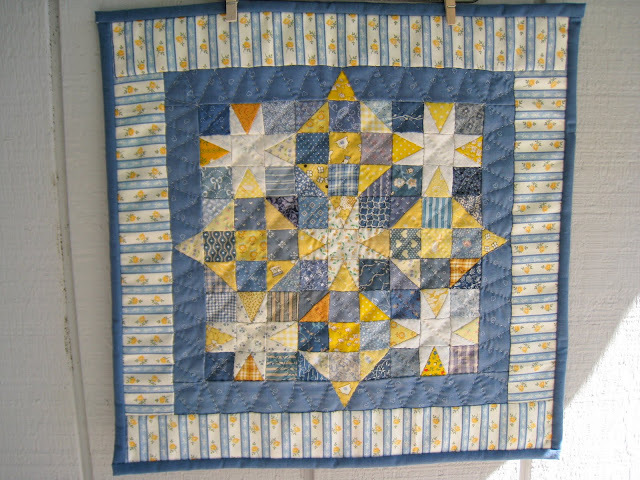 And it shows off some of my hand-quilting, the feather wreaths in the big blocks. The other thing you need to know about my way of quilting is that I can NEVER use the same 4 or 5 fabrics over and over again; there has to be more like 20 or 30 different fabrics. That way I never get bored! So for my final example here is a throw-size quilt to show you how many blues I have in my collection. 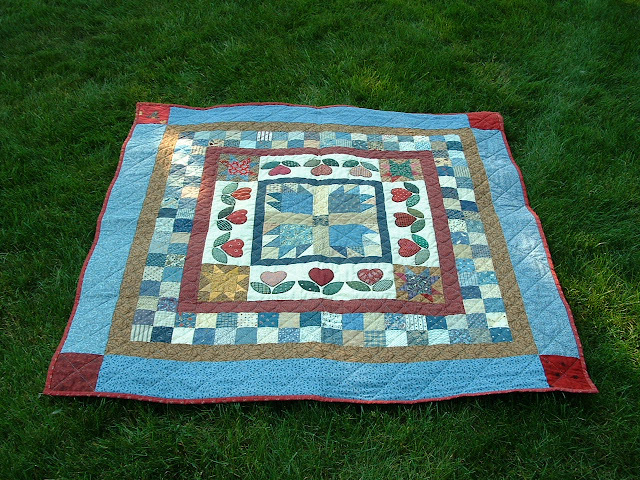 It is about 48 inches square, made in 1997, my own interpretation of a Little Quilts pattern. The center panel is a Bearpaw block, but that's another story for another time. Welcome to my blog! My advice to you is "never say never!" This is the last thing I thought I'd be doing, but my mind has been changed, so here we go! I'll start this blog by posting some of my favorite cards, usually created as a result of a challenge at the Hero Arts Blog each week. Who knows what it will evolve into over time? Making cards gives me much joy and a creative outlet in my life. 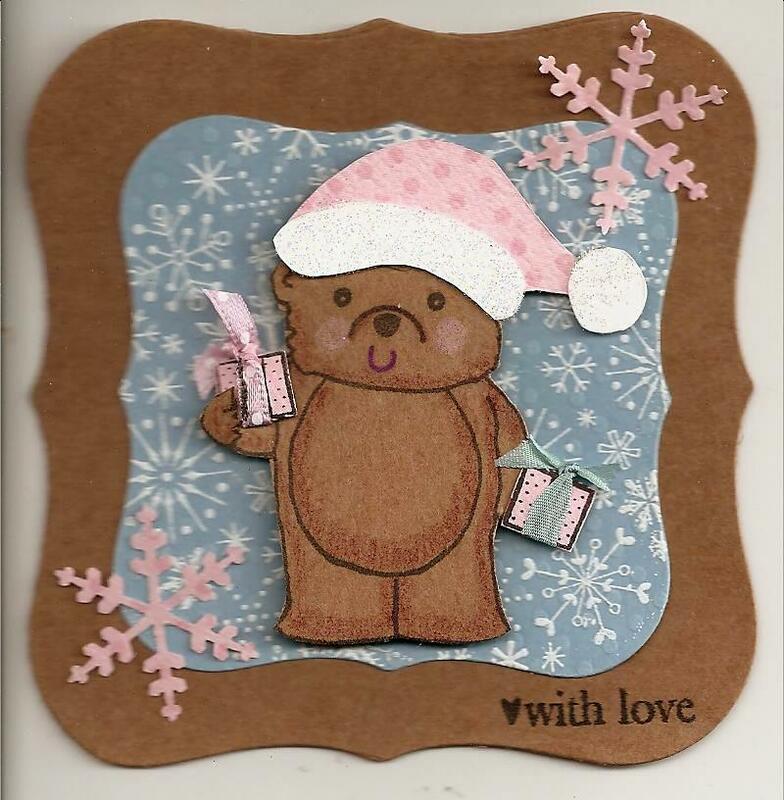 Here is a card I made recently, using a little set of Hero Arts SparkleClear stamps. It reflects the coming season, and uses a sentiment that I have adopted as a motto for my life, to find joy everyday. I hope you try to do the same.